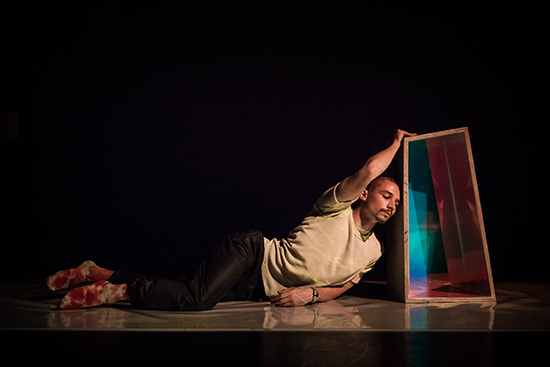 For the second semi-final we more or less pick up where we left off with the first with a work by a VCA-trained choreographer, currently based in Melbourne, whose creative practice has strong links to ideas around both conceptual choreography and postdramatic theatre. Rebecca Jensen’s Explorer plays out like an eccentric pantomime. First, Andre Jessop Smith, dressed in a marble-print bodysuit, enters from upstage. Advancing past a heap of white sheets, he switches on a sampler sitting on the floor beneath a tree branch suspended from the ceiling. Jensen enters, wearing snow goggles and wielding a leafblower. Dancers in white bodysuits are revealed under the white sheets. Jensen clambers over them to a crunching, rattling aural accompaniment. Is this a winter scene? Is the leafblower in fact a snow blower? Amid the mess of props and idle bodies, a story of landscape exploration emerges. We hear a splash and the lights change to a rippling water effect. Jensen is now deep-sea diving. Crab-like, she scuttles around the edge of the stage. Later, supported acrobalance style by Smith, we watch her rise from the water and through the clouds (suggested by a smoke machine and printed backdrop), reinventing herself like Helene Cixous’ airborne swimmer: the figure who is dispersible, prodigious, desirous and capable of being others. Carried on Smith’s shoulders up into the audience, all the way to the back row, she reaches out her hand as if to touch the face of—what? Here the work abruptly breaks off, and we are left to wonder at this image of a dancer in distant orbit. The mood turns more contemplative with James Batchelor’s Inhabited Geometries, a visually attractive if somewhat opaque work. 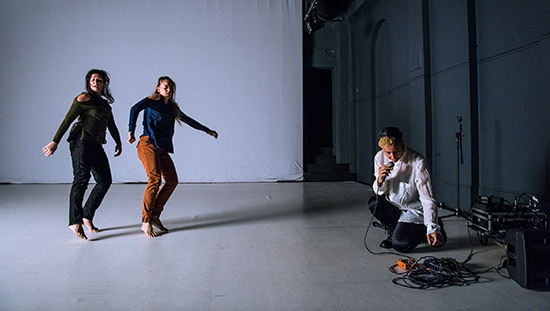 It has a similar science fiction feel to a piece called Island that he developed as part of a Dancehouse residency in 2015. Batchelor is one of the country’s most stylish young choreographers in terms of creating overall stage pictures, and he also knows how to find the right collaborators for his projects. This new work opens with Batchelor, partially hidden by shadows, lying prone on a grey slab toward the back of the space. As he starts to move, the slab comes apart, separating into three blocks. In slow motion, he folds himself into a space between two of them. For an instant, his face is caught in a spotlight, and we see the glint of a long gloop of ectoplasmic slime slipping from his forehead. Has his body been punctured by one of the slab’s hard corners? Or is he liquefying, collapsing under the pressure of all that dark obscurity? Intricate, abstract animations designed by Zoe Scoglio are projected onto a screen at the back of the stage, lingering for a moment, like Arctic auroras, then fading back to black. Faint splashes of prismatic colour slide across the floor and the walls. Morgan Hickenbotham sits with a laptop at a desk against the rear wall, live mixing the ambient score. Batchelor slowly crawls across the stage. Is Inhabited Geometries, with all its dim intensity and shards of opalescence, perhaps a bit too refined? Is this really a dance about homelessness, as was suggested in early publicity material? According to the program notes, Batchelor spent time living rough on the streets as research, but I wonder if the image of exquisite pain he presents us with here is really adequate to that theme. And yet, if we think of this Inhabited Geometries as an aesthetic exploration of the stage possibilities for mobile architecture, a problem which was also touched on in Island, then it seems a more conceptually satisfying albeit narrower piece. The three dancers, Elle Evangelista, Melanie Palomares and Melinda Tyquin, come prancing onto the stage in black sleeveless tops, what look like crosses between black pantaloons and grass skirts, and white cut-out, mask-like headdresses. They advance diagonally downstage, taking quick steps in time with busy, shuffling beats provided by composer Ania Reynolds. Occasionally the dancers freeze, and one or two or three of them look out toward the audience, as if uncertain or mistrustful. The headdresses are called dhoeri in the Western Torres Strait and are used by Islander women in ceremonial dances. Audiences will recognise them as the white device featured on the region’s flag. For choreographer Ghenoa Gela, herself an Islander, the problem is how to combine these traditional dances with her own background in contemporary western dance styles. The air of uncertainty in the opening moments speaks to Gela’s own anxiety, which she describes in the program, about what happens to traditional dance when performed for non-traditional audiences by non-traditional dancers. And the great strength of this piece is the direct and unpretentious development of this theme. Gradually, hesitation is overcome; the dancers move with more attack and more feeling. Mistrust transforms into a kind of stomping, whooping joy. One of the dancers, Tyquin, is fitted with a GoPro camera which, during one section, streams a live feed to a screen behind the dancers. 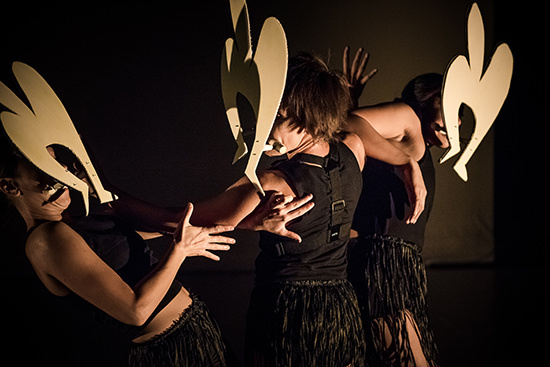 This aspect of the work is underdeveloped, perhaps even superfluous, and there are some other design choices—such as glow-in-the-dark paint on the headdresses—which seem a bit naff; still, with its high-energy dynamic, clear dramatic arc and emphasis on actual dance steps, Fragments of Malungoka makes a clear contrast to everything that comes before it on the program. Whether or not it stands out from other attempts to develop a contemporary dance language out of traditional materials is a different question. Paea Leach’s One and One and One also makes a strong contrast. Described as a trio for two dancers and a performance poet, the work speaks to feelings of and fear of loneliness. 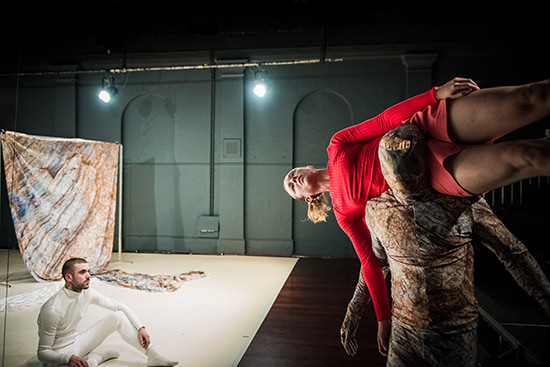 With loose, slightly ragged movements, the two dancers, Leach and Rhiannon Newton, seem always on the verge of falling out of unison, or losing contact entirely. It’s almost like they’re describing a relationship held together only by a mutual dread of being alone. There is anxiety here, and disappointment and frustration. Royalle seems to stalk the performers, following them around the stage, keeping them off balance with her words. We often see choreographers exploring the potential for experimental dance to unsettle language, but this is a movement in the other direction. “Am I really always the savage animal you expect me to be?” she says, sneering. Royalle is a charismatic performer giving a very strong performance. In the final moments, she seems to dominate completely. Standing centre stage, she turns to the audience while the dancers stand off to the side, finally submitting to the power of speech. Now the words are addressed to contemporary dance itself. Why dance, she demands. Why not use words? Why not just say what you mean? The obscurities of contemporary dance, she suggests, are a symptom of fear, a fear of being misunderstood or rejected. Face the fear, she urges. Make dance that speaks explicitly to social issues: to racism and the plight of refugees and injustice everywhere. Don’t hide behind concepts. It’s a bold message to bring to the KCA, this demand for legible meaning, this impatience with the ambiguities of the body. And it’s a message which, powerful as it is, does tend to diminish the significance of Leach’s choreography. It’s interesting that neither Paea Leach nor James Batchelor, both of whom attracted plenty of support among reviewers and in post-show foyer conversations (and whose works were arguably the most formally satisfying of the semi-finalists), were picked for the finals. Instead, it was Ghenoa Gela, Rebecca Jensen, Sarah Aiken and Martin Hansen who travelled to Sydney for the season at Carriageworks. Of these four, it seems to me that Aiken, Jensen and Martin all share a similar artistic genealogy, perhaps traceable to Jerome Bel’s assertion that choreography is a frame in which much more than dance is inscribed. The work they created for the KCA might be a little scrappy, but it does make new claims for how dance can be experienced, which fits with the stated goals of the KCA. And yet, it was Gela’s work which took home both the overall prize ($30,000) and also the people’s choice award ($10,000). Some commentators have already suggested changes to the commissioning process for the KCA, and no doubt there are things that might be tinkered with to encourage the creation of stronger individual works. One idea recently mooted is to downplay the competitive aspect of the award. This, I think, would be a mistake. It’s vital that the award remains competitive. The function of the award is not simply to support artists, but also to foster a critically engaged audience. Competition gives audiences an immediate focus: a reason for thinking about what they value and why. And, yes, it’s vital that a critical appreciation of the more expansive definition of choreography encompassed by the KCA is fostered. If we don’t, we risk falling into repetitive and needlessly divisive debates about whether this is really dance or not. Simply put: there is conceptual choreography that works, and there is conceptual choreography that doesn’t. And this is what we should be talking about. So, does a perceived weakness of this year’s field explain the judges’ decision to give the award to a less conceptually ambitious work, one directed more toward personal dance methodologies than shifting the choreographic paradigm? Maybe—though it does send a mixed message about what the award stands for. Of course, another possibility—which is just as likely—is that the judges saw something radical in Fragments of Malungoka that I missed. In any case, it’s a point worth arguing about.